It started during Heritage Open Days in September 2010. 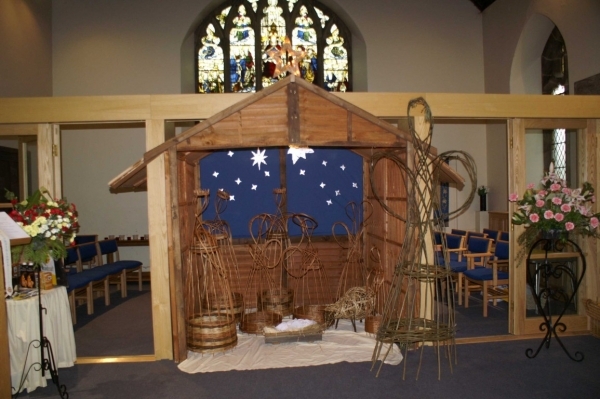 Ruth ran a childrens activity at St Cuthberts church in Bedlington, Northumberland making a seven foot angel from green willow which remained in the church once the event was over. 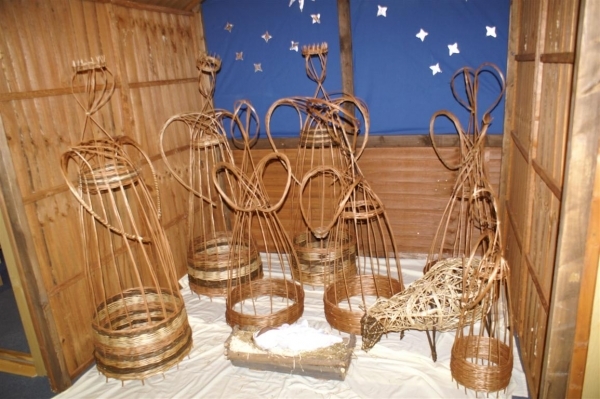 The churchwardens were captivated by the decorative potential of willow in a church setting and decided that they would like a complete willow nativity scene to accompany the angel as their previous hand-made nativity was several years old and ready for replacement. 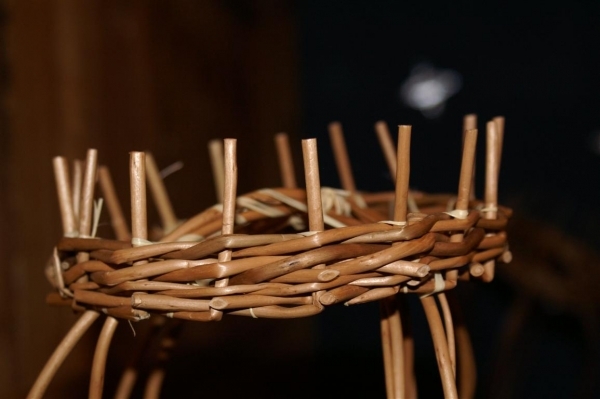 They contacted Ruth who passed on the request to the Northumbria Basketry Group. 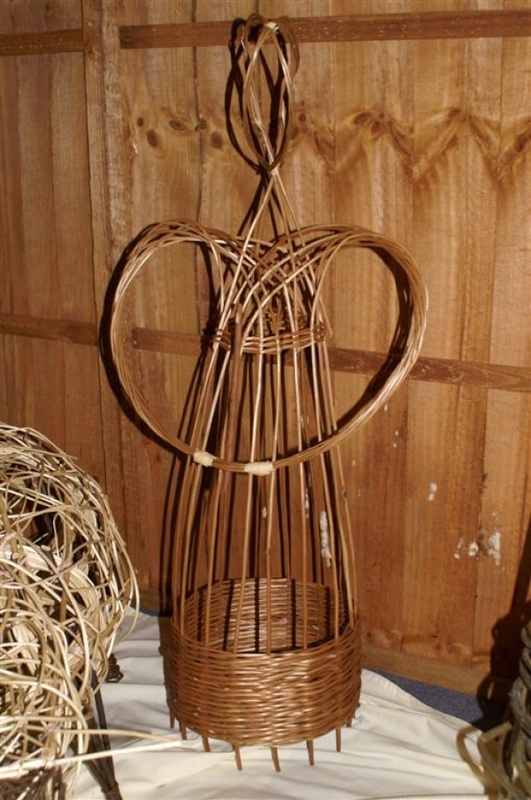 A previous member of the group had made a beautiful and much admired willow angel. Sheila had made a copy which became the starting point for the design of the nativity figures, but with the wings in the original angel design curved into a different shape to become arms for the various figures. 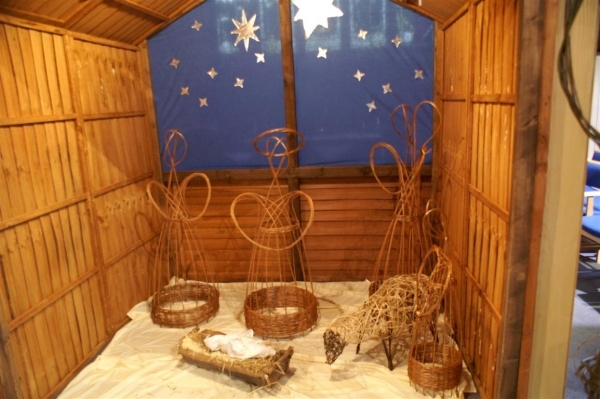 The church people had a clear idea of both the number and the dimensions of the figures they would like, as everything had to fit into their stable, a flat-pack shed with an open front which had been made specifically for use inside the church. Mary was to be 4 (1.2m), Joseph and the shepherds around 5 (1.5m) and the kings were to be slightly taller again. These heights meant that the bases of the figures would be between 17 and 21 (43 to 53cm) in diameter. Sheila initiated the project by making a little shepherd boy figure from buff willow, complete with flute, as a trial run for her adapted angel design. Charlotte then borrowed it to use as her pattern. She had chosen to make the three kings using coloured willow as well as buff to give a decorative appearance representing the kings lavishly coloured robes. All Sheilas figures were made in plain buff willow. After a certain amount of experimentation Charlotte also devised a successful way of making the crowns so that they held together well and did not fall apart as soon as they dried out. 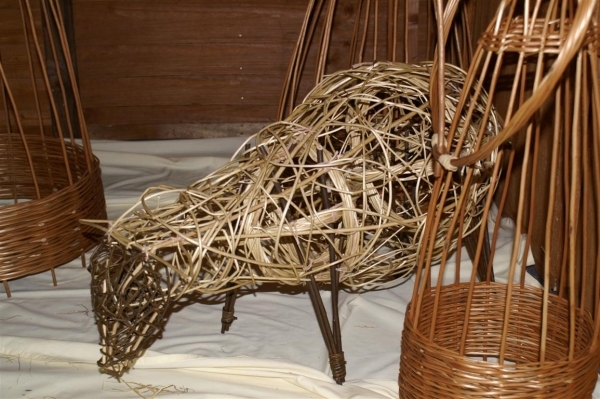 Mary volunteered to provide the livestock input by making a sheep, having previously made one at a workshop. This was extremely time-consuming but the sheep proved to be an extremely popular feature of the completed display. Sourcing the white willow at short notice was not straightforward but the beautiful result justified the effort involved. In the meantime Sheila also made the Mary and Joseph figures, and a shepherd holding a large crook. At the request of the churchwardens Mary was the only figure to have a halo. The three people who made the figures lived 30 to 50 miles away from each other around Northumberland and Durham so transport required a certain amount of logistical planning. Mary and another group member who had camper vans helped out at this stage, making the project even more of a team effort. The figures were delivered to St Cuthberts just in time for the display to be set up in the church at the appropriate time. We had been given a warm invitation to see the completed nativity in its intended setting so after Christmas, when life had returned to normal and the snow had cleared to some extent, Mary and Sheila visited the church and took photographs. The churchwardens told them with great enthusiasm that the whole display had been extremely successful and very popular, and they were clearly delighted with it. By January the original angel had reached the end of its useful life. It had never been intended for long-term use and it was in any case too large to go up the steps of the church tower to the storeroom. The other nativity figures and the sheep will however be used each Christmas for the next few years. Everyone who took part in the NBGs first large-scale commission was extremely pleased with its end result, the outcome of some excellent teamwork, and greatly appreciated the positive and enthusiastic response from its recipients.